Also, the major—though blind—is otherwise in fairly good health, while Dhuni Chand carries around with him a bunch of pills. Pill #so-and-so must be taken with cold water, pill #so-and-so with hot water, this for when he’s anxious, that for when he’s too excited, and so on and so forth. This time, when he comes to visit Major Sahib, Dhuni Chand is very anxious (he’s come, with much trepidation and after much nagging from his termagant of a wife, to suggest their daughter as a prospective bride for Major Sahib’s younger son). Dhuni Chand is so anxious that he needs to take one of his pills, and asks for a glass of hot water. 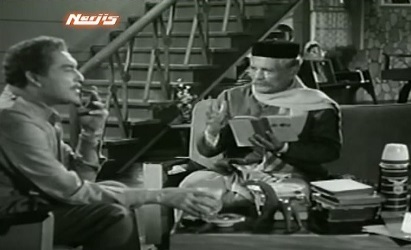 Major Sahib’s old servant Jumman (Kumud Tripathi) brings a glassful of water and places it on the coffee table. Dhuni Chand has his medicine with a sip of water, and the major, his hand accidentally brushing against the glass, discovers that the water is cold instead of hot. Soon after, Dhuni Chand, trying to tell the major just how wonderful his daughter is, says that she writes poetry. He reads out some of her verses, and Major Sahib is surprised to hear a snort of derisive laughter from Jumman, who is hanging around near the kitchen door. Later, when Dhuni Chand has gone his way, Major Sahib summons Jumman. You humiliated my friend, he says. Just because Dhuni Chand is poor does not mean that I do not respect him—but you showed no respect for him, and by doing that, you shamed me, he says. 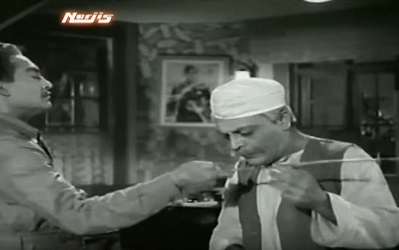 Jumman is told to bring the switch that hangs from a hook in the nearby wall, and having done so, automatically positions himself with his back to Major Sahib. Major Sahib lashes him thrice across the back. Just then, Major Sahib’s elder son, a police inspector named Shrikant ‘Shri’ (Raj Kumar) enters the room. Shri is appalled to see his father lashing Jumman, and—when Jumman has gone back to the kitchen—tries to reason with his father: wouldn’t it have been better to have merely scolded Jumman? He is an old man, a poor man. A servant, too, who has faithfully served the family all these years. Is a lashing really necessary? 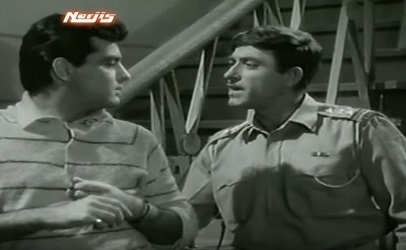 While Jumman eavesdrops from the kitchen door and tries to signal to Shri to shut up, Major Sahib gives his rationale. Jumman should know better by now that Major Sahib will not tolerate such behaviour. Later, as Jumman is leaving for the day, Shri sees that the Major has given the old servant Rs 50: a compensation, by no means small, for the lashing. Major Sahib has some very strict principles, but he is also extremely fair. And Shri, like his father, has principles too—but his is a somewhat more balanced personality. He will not go so far as to lash a man for not adhering to those principles; he will also not go to the other extreme and give him money to alleviate the pain of suffering the punishment for his transgressions. And on this is founded the story of this film. Even though the catalyst for the ‘action’, so to say, is neither Major Sahib nor Shri, but Shri’s younger brother Rajnikant ‘Rajjo’ (Feroze Khan), who studies in a college in Madras. When Rajjo comes home for the vacation, Shri tries to caution their father: Rajjo is veering off the straight and narrow—“He has changed”. There is nothing concrete Shri can point to, but this is possibly a result of the pranks and frivolity he sees Rajjo display within the first few minutes of returning home. Major Sahib is dismissive. Of course Rajjo will change; he was a boy when he went off to college. Now he’s a man. Shri is being unnecessarily anxious. Unduly anxious. But Shri’s fears, it appears, are not completely unfounded. Unknown to him and Major Sahib, Rajjo has sneaked off for a date with his girlfriend Bimla (KR Vijaya) in Kodaikanal. Not, in itself, anything to be suspicious about: they sing a lovely, romantic song and dance through the trees and along the lake. However, Shri is around when, on Rajjo’s birthday, a slew of envelopes arrive, nearly all of them greeting cards addressed to Rajjo. One envelope, addressed to Shri Kant—which, of course, can be interpreted as ‘Mr Kant’—Rajjo passes to Shri, thinking it’s for him. And Shri, opening it and reading the enclosed letter, discovers the shocking truth. The letter is from Bimla (whom Shri doesn’t know), but it’s self-explanatory. She is pregnant, and unless Rajjo hurries up and marries her, her name will be mud. Please come soon, she writes. Shri is quick to realize the implications of this. Their father will be devastated—after all, it’s not merely a question of reputation and honour or even the fact that Major Chandrakant has given his word that Rajjo will marry Dhuni Chand’s daughter; it is a matter of principle. This is not how a son of Major Chandrakant’s should behave. If Rajjo will hurry and fix up his marriage with this Bimla, perhaps all may not be lost. They can keep this sordid truth hidden. The problem, however, has just begun. Within a short time, it escalates and takes on proportions that neither Shri nor Rajjo could have imagined. And it throws up conflicts of different types: between love and duty, between trust and honour, between vengeance and guilt. The offbeat theme, based on renowned Tamil film maker and writer K Balachander’s play, Major Chandrakanth. Yes, the ‘unwed mother’ trope is a familiar one in Hindi cinema, but Oonche Log examines it from a different angle. Not the angle of the woman, not even the angle of the man who is responsible and should, by the norms and expectations of society, marry her—but the angle of those related to them. The brother of a sister who is wronged (and wronged to such an extent that there’s no going back). The brother and father of a man who has gone against all the principles that they hold dear, and which they have tried to inculcate in him (and which he mouths obediently). How do these men—the nearest living relatives of the two central characters—react to what happens? What sets Oonche Log apart from the run-of-the-mill Hindi film is that the affair between Rajjo and Bimla, while it is the pivotal plot element, is not the focus of the film. Very little screen time (most of it taken up by two songs) is devoted to it. Romance, in fact, is not a part of the film. Shri, despite being engaged, is never shown with his fiancée (whom anyway we only see, that too from a distance, in a photograph). And Rajjo’s ‘love’ for Bimla is, despite the dreaminess of those two songs, probably not much more than lust. (Interestingly, since the peripheral characters are all male, this makes for a fairly male-centric film. Apart from Bimla, the only other female character we actually get to see is Dhuni Chand’s wife, and that too very briefly. The men form the bulk of the cast here). The last half-hour or so of the film is of particular note: it’s a fine bit of writing, because the twists and turns in the plot allow for some good insights into human nature. How far can a man trust another? Especially one who is a stranger—until an odd coincidence reveals that these two men are not strangers after all, but tied by a till then invisible thread that has suddenly become a rope, a noose around both their necks? What should take precedence? Principles, or love? Family, or integrity? When push comes to shove, what does a man choose? And, yes: the music. 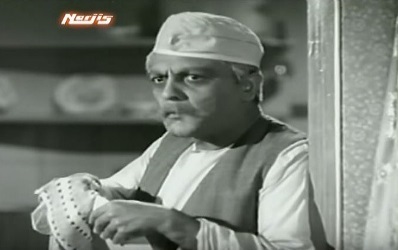 Chitragupta composed the music for Majrooh Sultanpuri’s lyrics for Oonche Log, and gave it two of his loveliest songs: the dreamy Jaag dil-e-deewaana, and the romantic Aaja re mere pyaar ke raahi. Oonche Log could have done with better writing, better direction, and better editing. The problem is that the main story, the actual crux of the film, lies only in about the second half of it. The first half only aims to build up to that climax. Which is all very well, except that the first half tends to meander and go off on tangents. Some are critical to the story or to the characterizations; others are not. For example, that scene which I quoted in the beginning of this review seems inconsequential when first viewed, but ends up being crucial to understanding the characters of both Major Sahib and Shri—but there are several other scenes of this sort, which, beyond a point, become tedious. Most of the scenes involving Jumman and/or Dhuni Chand seemed to me to be forced: superfluous, mostly there for (questionable) comic relief, and distracting. Besides that, though, I found this a good, fairly satisfying film. I had watched it mainly for the songs, and because I remembered Shilpi Bose mentioning it as one of her father’s films, but I hadn’t held out much hope. Raj Kumar and Feroze Khan are not among my favourites, so I was banking on Ashok Kumar and Tarun Bose to see me through. 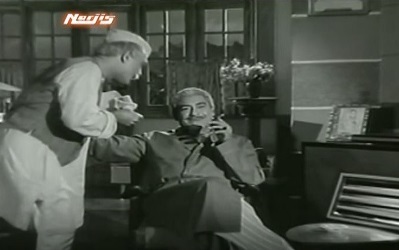 Ashok Kumar delivered; Tarun Bose (despite having relatively limited screen time) did, too. And, to my surprise, Raj Kumar wasn’t as irritating as I usually find him. All in all, a film worth a watch. At any rate, offbeat. While Major Chandrakanth was originally written in Tamil by K Balachander, he only adapted to the screen and made a Tamil-language film from it the year after Oonche Log (which was directed by Phani Majumdar) was released. Major Chandrakanth (the name of the play was retained for the film) was released in 1966 and made its star, Sundarrajan, so popular that he became known as ‘Major’ Sundarrajan in the wake of his role in this film. How we can forget another gem of a song ‘ haaye re tere chanchal nainva ‘ of lata ? I didn’t forget. I just don’t particularly like that song, so didn’t think it worthy of mention. I was smiling and enjoying the scene you have described so well and then comes the lashing. That put me off completely. Doesn’t make me like the Major Saab nor his servant Jumman. Shri sounds to be a nice guy. So let’s see what comes ahead. Now, all that you’ve written in “What I liked about this film:” makes me want to watch the movie. Indeed, I’ve been wanting to watch it ever since Shilpi Bose wrote her take on of this film. I’m curious now, what you didn’t like. 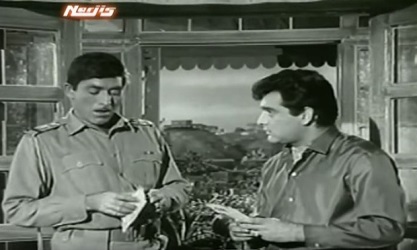 I like him in the 1960s, it is his 70’s avatar, which puts me off, all the jaani thing. I liked him in Dil Apna and Dil Ek Mandir. So, do I understand you right, the Hindi film, though based on K.Balachander’s play, was adapted by Phani Majumdar (or somebody else)? Thanks for the wonderful review. It made a good reading. Yes, that lashing of Jumman put me off. It was not at all the sort of thing I’d expect a character who was supposed to be ‘upright’ to be doing. I did appreciate, though, that his son comes and faces up to him about that. Talking of Raj Kumar, I hate his jaani phase too, though it’s not just in the 70s – it began in the 60s itself, when I remember him using it in Waqt. But he’s mostly bearable in the 60s (barring some films like Neelkamal, which was horrible throughout). Never a favourite of mine, though I’d probably rate – besides the films you’ve mentioned – Godaan and Oonche Log – as among my favourite films of his. Yes, Phani Majumdar wrote the screenplay of Oonche Log, besides directing the movie. I have not seen the Hindi version of the film – actually have put off seeing it – only because I am a huge fan of the Tamil film. So I will talk about it. Nagesh and Jayalalitha (in a cameo as the wronged woman) are the brother and sister. This was a film I watched expected to like, but ended up loving it. The roles of the 2 sons never really registered for me – not that it is inconsequential, but they are mere counterpoints – it is really about the Major and the brother of the girl. Soundararajan overdoes his role a bit, but is still convincing. 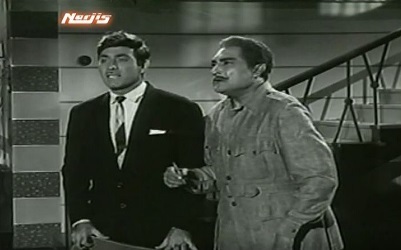 Nagesh is the standout as the brother and steals the film. It is their interaction that I remember in the film and the rest sort of fades to the background. Music in the Tamil film is excellent – there is a particularly cute (albeit completely improbable) song picturization where the sister pretends to be singing on the radio while her brother plays all the instruments using various kitchen items. And all the neighbors are fooled. More than anything, it is just innovative. Having an actor like Raaj Kumar as the son makes me wonder if that skews the focus of the film when compared to the Tamil equivalent. I may end up taking this film off the back-burner and watch it, spurred by your review. That’s a very interesting comment, sangeetbhakt, because the Hindi film is completely – or at least till the last half-hour or so – from the point of view of the family of the man. I did read the synopsis of the original play on Wikipedia after I’d finished watching this film, and was surprised to discover that that seemed to suggest that the play is from the point of view of the woman’s brother. I see now that the major and the brother are the focal characters. Which does happen, to some extent, in the Hindi film too, but in Oonche Log, the interactions between the elder son and the major are as important as are the interactions between the major and the woman’s brother. (I think you’re right about Raj Kumar’s role being made prominent because he was Raj Kumar). I wanted very much to watch the Tamil film after I’d seen this. I did search a bit on Youtube, but without much success, and gave up after a while. Now, having read your take on it, I think I should definitely search for it more diligently – see, too, if I can find a subtitled DVD for sale somewhere. Now, this makes me want to watch the K. Balachander version too. The Tamil original of “Pyaar kiye jaa” again is (for my personal tastes) faaaaar superior to the Hindi version. It is sometimes hard to compare 2 versions unless one is equally familiar with both languages and cultural contexts. “Kaadhalikka neramillai” (Not enough time to fall in love”) has a great cast and as Anu already mentioned – Nagesh is brilliant in the original of the Mehmood role. And his dancing skills are amazing. It is not as if “Pyaar kiye jaa” is not funny, it is just that the Tamil one is funnier. I have both these films in Tamil – but I cannot recall if they have subtitles. Sadly am not home to check on that. But the problem with these films is that the subtitles are so terribly that any film becomes an unintentional comedy. I wish somebody would put the effort into doing good subtitles – but I am not sure if there is enough of a market for these films to actually make the investment worth anybody’s while. If they do, I will post a link here to where they can be ordered on-line. Speaking of K Balachander, there are several other films of his which are well worth watching. Possibly my favorite is “AvargaL” (Them) which stars Rajnikanth, Sujatha and Kamalahasan in a smaller role. Unusual film of a sadistic husband played to perfection by Rajnikanth. Brilliantly directed and acted. I don’t think this was ever made in Hindi. The other is “Apoorva raagangaL” (Unusual raagas) *ring Kamalahasan, Srividya, Major Soundararajan and Jayasudha. In this film, Rajnikanth makes his cinematic debut in a small (but memorable) appearance. Both Kamal and Rajnikanth owed KB a lot for their initial training. The latter was made in Hindi by KB himself as “Ek nayi paheli” with Kamalahasan, Hema Malini, Raaj Kumar and Padmini Kolhapure in the equivalent roles; but I think it flopped quite miserably. I remember reading that the unusual storyline did not sit well with northern audiences. I can go on about KB’s films – many of which have unusual stories/themes and have great actors/acting. Which is such a shame, really. And a lot of films, I think, would appeal, at least, to a lot of other Indian viewers too – after all, if these films were remade in Hindi (or, as in the case of Karnan) also dubbed in Hindi, why not try subtitling some of the more popular films? I have lost track, for instance, of the number of people who’ve recommended films to me, and which I’m wanting to see, but can’t, simply because I can’t find a subtitled version. sangeetbhakt, totally agree about the Kaadhalikaa Neramillai being far superior to Pyar Kiye Jaa. :) Absolutely! The only things I liked about the Hindi version are: 1) Shashi Kapoor – he was a darn sight better than Ravichandran! 2) I thought the ‘making a film’ sequence was filmed much better in Hindi. While Nagesh did a fantastic job, there was something about the way the whole scene is staged that made it so much more effective in the Hindi version. I will also second both your recommendations – Avargal where I thought Sujatha was fantastic!, and Apoorva Raagangal. If you can get sub-titled DVDs, Madhu, do watch. Completely agree with you Anu. Shashi was better looking, but Ravichandran wasn’t as bad since he was so young (wasn’t this his first film?). The thing that amazes me though is that they look so much older and yet they are all playing college guys. I remember a Rajendra Kumar/Vyjayanthimala film where they college kids – it was ridiculous. I liked Mumtaz in Hindi more than Sachu. 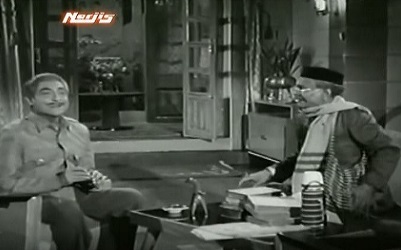 Mumtaz surprised me completely and bowled me over with her comedic timing – her scene when she tries to learn love scenes from Mehmood stands out in my mind. On the “making a film” part, what I had liked more in Tamil was Baliah. I am very fond of Om Prakash, but I thought Baliah was just genius in that scene. Another KB film btw that I liked (though it has been decades since I saw it) was “Iru koDugaL” (Two lines). I recall the dialog being very good. sangeetbhakt, let me be very clear here – I adore Mumtaz, and yes, as the second lead, I thought she was brilliant. It is only in this dance sequence that I think Sachu wins hands down. The dance sequence in Hindi is not half as good. You know, Anu, not just the Tamil original of O meri maina, I’ve been wanting to see the Tamil original of Pyaar Kiye Jaa for a long time now! Major Chandrakanth is available on YouTube, in parts; unfortunately, it is not sub-titled. And that’s the problem with regional films; every time someone complains that Hindi movies (or very contemptuously, ‘Bollywood’) are taking over, and how regional cinema is suffering, my question is – why aren’t regional film-makers making their films available to the larger film-going masses by adequately subtitling films and DVDs and ensuring they are properly distributed? I talk about Malayalam and Tamil cinema to movie buffs, but they either can’t source the movies I mention, or if DVDs are found, they are not subtitled. It’s a shame because there are such beautiful films there that I would love to share with them. Okay, it was my adblocker that was causing the blackout; here’s the song I was talking about, the O meri maina sequence in the original. Anu, thank you so much! Malar Endra was so much fun – especially Nagesh, who was a scream. The music, too, is wonderful (it reminded me of some American tune, I think – seemed very familiar at any rate). Loved that! Oh, definitely! :) But Sachu is a better dancer. What is the dance appreciation version of being ‘tone-deaf’? Because that’s me. I think, also, that Mumtaz is so cute that when she’s onscreen, I’m looking only at her face, and not at how she’s dancing – especially since she’s not distractingly bad at dancing. In 2013, I devoted a month to regional cinema, and finding subtitled films to review was such an uphill task – especially since I kept coming across mentions of films that won National Awards and the like. You’d think a film with enough merit for that would have been subbed? But no. :-( I have come to the conclusion that the one regional language of which one is mostly likely to find subbed (and decently subbed, too) films is Bengali. Not just Ray, of course, or other major Bengali directors known even outside Bengal, but even the ones non-Bengalis don’t know of. I wish other regional film makers would take their cue from Bengal. I have very distinct memories of all major scenes of the film, even though I have seen it in 1966 only, as a first year college student. The songs, obviously, did make a favorable impact, as I read through the review, I strongly recollect that the way Ashok Kumar, and Raj Kumar as well, portrayed their characters had left that indelible impression on our the then formative mind. 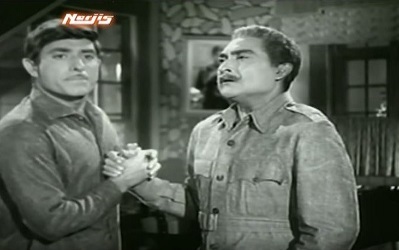 I agree, Ashok Kumar and Raj Kumar’s characters, their interactions, and their acting, is memorable. Tarun Bose, too, who I thought, despite his relatively brief role, was compelling. This Madhu was due to necessity I think. K. Balachander was at that time still working in AG’s office Chennai and he had an amateur theatre group where the actors used to be male.. hence there would be in his plays at the most a couple of female characters many a time these were played by males in drag. I am not too sure( some of my older cousins who would have seen the play might vouch for it) , I think that they might have done away with Bimla’s presence all together – the affair and subsequent death (spoiler?) may have been only mentioned. It still surprises that KR Vijaya played the role in Hindi I fell off my chair when I saw the hindi version the first time. The movie though a talkie as most K B movies go was overall quite good. Did you notice the name of the second son! A decade later, a certain Sivaji Rao Gaekwad was rechristened that by Balachander as he had fond memories of the name. Thanky ou for the interesing info, kayyessee! Your explanations make many a things sound plausible and that Rajnikanth name. Wow! Thank you. Wow! You know, when the name came on, I thought, “Ah. That’s a coincidence!” Now you tell me it wasn’t a coincidence. Thank you for that. And thank you, also, for telling me about how that largely male cast and storyline came about. That’s interesting – and, of course, it makes sense. Having discovered that, I am glad too that Phani Majumdar didn’t try and adapt the film too much for Hindi-speaking audience tastes when it came to the inclusion of women. Thank you for the link to Oru Naal Yaaro; yes, now I see what was meant by that bit about using the kitchen utensils etc. Nice song. Shilpi, thank you for linking to your post – I read it all over again with much joy (especially the trivia section), because I had forgotten what you’d written about it. Yes, I do agree that this is one of your father’s finest performances – as also Ashok Kumar’s. The scenes between the two of them are excellent; I love the acting, of course, but I also love the way the scenes have been written. The way the dynamics between the two characters change… unforgettable. Read the post and comments with a lot of interest. This prompted me to watch the Tamil version. Though nagesh’s acting was excellent, as usual, I like to see him as a comedian:)) Enjoyed jayalalitha”‘s “oru naal yaro” and watched a movie called galatta kalyanam, which has jayalalitha, nagesh and sivaji ganesan in lead roles. Then, sadly, a week later, I heard that jayalalitha had passed away. She was a graceful dancer and a brave personality. Do please watch galatta kalyanam if you find the subtitles. No OTT despite sivaji ganesan in a lead role, humorous story and a 60s movie. I shall look out for a subbed version of Galatta Kalyanam, but with no very lively hope of success. :-( It sounds like something I’d like to watch, but oh, the sad lack of subbed films available.